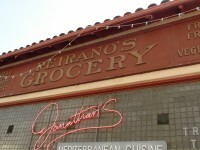 Converted into Jonathan’s Restaurant in 1998, Peirano’s Market was Ventura’s first commercial building, constructed in 1877 for Italian merchant Alex Gandolfo. His nephew, Nick Peirano, took over the general store in 1890 and the store remained in the family until the late 1980s. The murals on the west outside wall are typical of commercial advertising in the late 19th and early 20th centuries. In 1992, archaeologists discovered an elaborate Mission era “lavanderia” (laundry) with a 26 by 30 foot washing pool under the building, constructed by Chumash mission converts as part of the aqueduct system during the early 1800s.